Want your kids’ parties to be the hottest ticket in town – literally? For party invitations with a difference check out Special Event Ticketing. 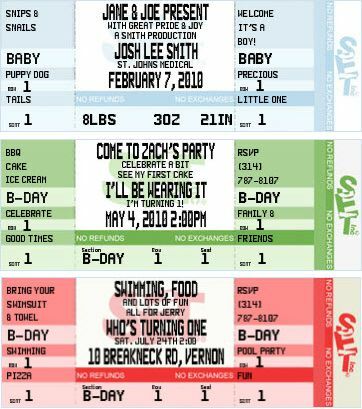 Using authentic ticket stock, they create invitations to parties, special events, baby showers, weddings and more (they’ll even print your birth announcements, ticket style). It would certainly fit with the theme next time your child asks for a dance party or wants all their friends aboard for a Thomas the Tank Engine theme. Tickets, with envelopes, start at US$1.29 each and extras such as lanyards and pouches are available (for a real ‘backstage pass’ feel). Special Event Ticketing ships to Australia.